File S/P-7, obtained from Captain George W. Newson, Comox, B.C. 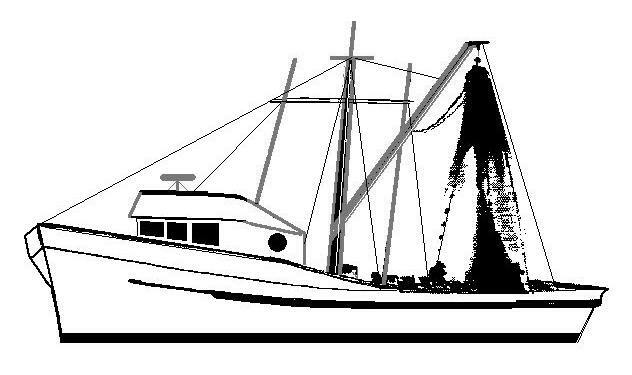 - Vessel name Kella Lee, hailing port Comox, commercial F/V, designed by Monk, LOA 50' x LWL 47' x Beam 15' x Draft 9' x 35 Tons - Sea anchor: 28-ft. Diameter C-9 military class parachute on 500' x 1/2" nylon braid rode, with 5/8" bronze ball bearing swivel - Full trip line - Deployed in a gale in shallow water (70 fathoms) about 40 miles west of lower Vancouver Island with winds of 30-35 knots and seas of 12-15 ft. - Vessel's bow yawed 10° - Drift was estimated to be 13 n.m. during 13 hours at sea anchor. Captain George Newson is the president of Newson Fisheries and a veteran of many gales in the Pacific Northwest. Whether longlining for halibut, trolling for salmon, or gillnetting for herring, the sea anchor has always played an important part in enhancing the safety, comfort and efficiency of his crew. Even as a young man he was accustomed to using government surplus parachutes while fishing Cape Flattery's stormy waters. On the occasion of this file he used a 28-ft. diameter military surplus (C-9) parachute on the west coast of Vancouver Island. He has since obtained - and used - a much heavier 24-ft. diameter Para-Tech sea anchor. I used a regular 28 ft. chute years ago while trolling salmon off the Washington coast. It was common practice for most of the West Coast troll fleet. We worked the area above Gray's Harbor, known as the Prairie. Most of the area was too deep for anchoring and too far away to run in, so we used parachutes for sea anchors. We rode out many NW gales in relative comfort, averaging 1 nautical mile of drift per hour to leeward in gale force winds. The boat always rode bow to the sea. The Para-Tech 24' diameter chute, being somewhat smaller and considerably heavier, tends to set easier than the government surplus 28-footers.... We pay out 500 ft. of 1/2" Samson double braid nylon rode, which is shackled to the bow.... The drift is reduced by two thirds. The ride is reasonable because of the elasticity of the long, thin rode. Update: Two years later Shane received another letter from Captain Newson, indicating that the 1/2" nylon braid had in fact broken in a gale. The break occurred right at the thimble area of the splice. Newson was able recover the parachute by powering up to the float. He now uses 5/8" nylon braid.